Merritt Island NWR is one of my favorite daytrips when I'm staying at my sister's place outside Osteen, FL. 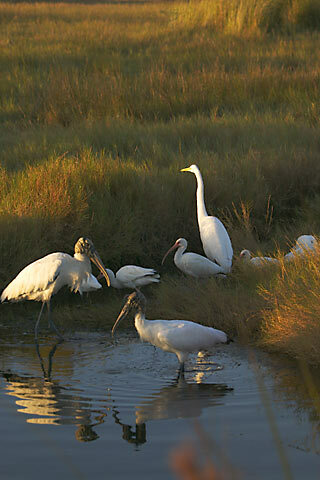 Merritt Island NWR is a short distance away and is usually packed with wildlife. The refuge is just east of Titusville, FL and shares a border with the Kennedy Space Center. Some 310 species of birds have been identified on the refuge. There are two drives through the refuge that are of interest. One is Black Point Wildlife Drive, a seven mile loop through some of the marshes and impoundments of the refuge. As wildlife is most active in the early morning and the late afternoon, I try to make it to the start of the drive just before dawn. Most of the wildlife is birds and an occasional alligator. The second drive is more anonymous and not advertised by the refuge. It's a 6 mile dirt road that runs on the top of dikes along the south eastern end of Mosquito Lagoon. The road's used mostly by boaters launching into Mosquito Lagoon, a few employees of the refuge and the Space Center, and a few like me who stumbled on the road accidentally. I've not found the road on any maps but one end is signed "Bio Lab Road." Here you'll find a lot of alligators, sometimes even on the road. You'll also find most of the shorebirds and waders, but not in the concentration you'll find on the Black Point Wildlife Drive. A Great Egret (Ardea alba) feeding by the shore of an impoundment. This is a large bird at a height of 38 inches and is common in this area. 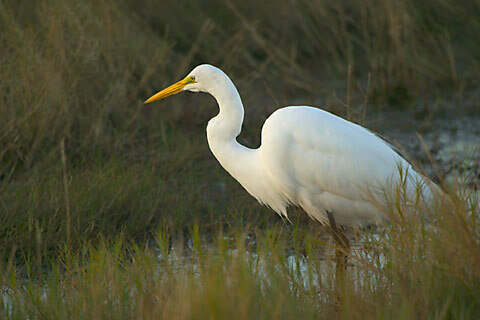 The Great White Heron, which is uncommon, is sometimes confused with this egret as the size and appearance is similar. The GW Heron however, has yellow legs instead of the black legs of the Great Egret. More Great Egrets . . . This Wood Stork (Mycteria americana) was in the same impoundment and was feeding alongside the Egret shown above. 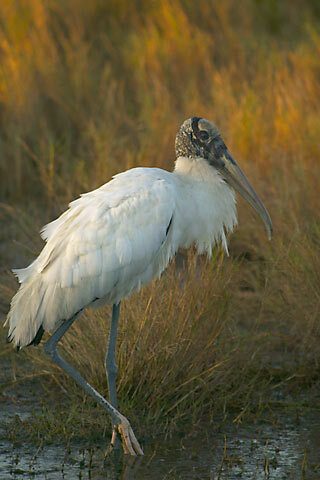 The Wood Stork is an uncommon bird over it's whole range and is listed as an endangered species. This bird is up to 47 inches tall with a wingspan up to 5 1/2 feet. You don't get to see these birds too often. This bird feeds with most of it's head underwater and it's beak open. While in that position, it wiggles one foot back-and-forth stirring up the bottom and any tasty crustaceans, tadpoles or small fish that may be there. When one of those little morsels touches the edge of the bill, they are dinner. The Stork feeds by touch, not sight, so has an advantage in muddy, weed-choked waters. More Wood Storks . . .
A rare grouping of birds feeding in the same pool. You have your Wood Storks, your Great Egret and even some White Ibis (the one in the center with the decurved bill.) I did not stage this shot and it's not a Photoshop trick! 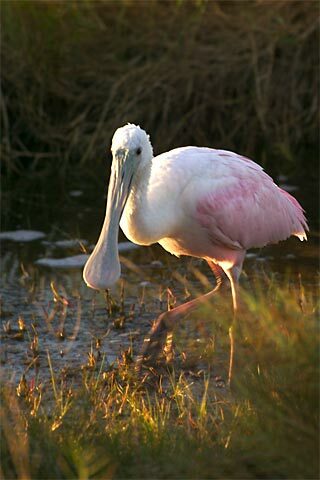 A Roseate Spoonbill (Ajaia ajaja). Fairly common but usually reclusive, this one was right up front along the impoundment for a while before it spooked and moved further into the refuge. This one feeds by dipping it's bill in the water and then swishing it back-and-forth rapidly - stirring up the bottom and any crustaceans that may be there. 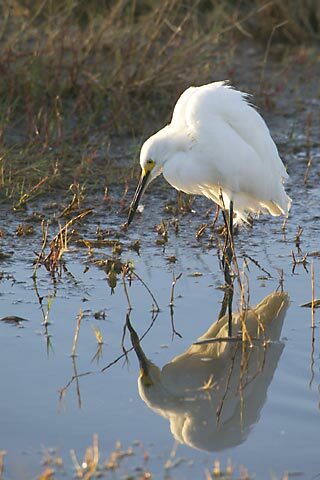 A Snowy Egret (Egretta thula), much smaller than the Great Egret at a maximum size of 27 inches. Like the Great Egret, it stands motionless looking for prey and when it sees a tasty morsel, snaps it from the water. More Snowy Egrets . . .
My best guess at this one is a Savannah Sparrow (Passerculus sandwichensis). 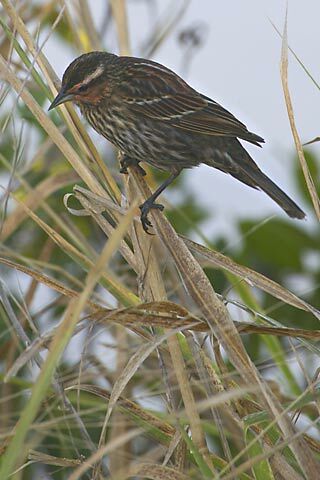 This is a common bird in this area and you see a lot of them foraging in the tall grasses along the dikes. An eight foot American Alligator. Although, there are an estimated 1.5 million of these bad boys in the swamps of Florida, this species still has protected status. They do have something to contribute to the environment and the survival of other species though. Their habit of digging holes in the swamp provides a place for water to collect in the dry season, thereby providing habitat for species which would otherwise disappear with no water. This one was sunning himself (herself?) beside a slough about twenty feet from me. I shot a couple pictures of him from the car, then got out to walk around and to look in the swamp on the other side of the road. When I turned around 20 seconds later, he was gone and there wasn't a ripple on the water. 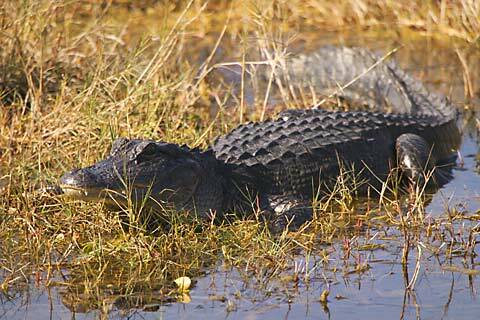 Alligators will not bother with you unless you make them feel threatened - keep reminding yourself of that.